Lonnie Dale Wassom passed this life on November 6, 2018 at his home at the age of 77. He was born on February 4, 1941 in Wagoner, OK to Jake Wassom and Beulah (Mae) Wassom. 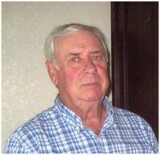 Lonnie attended Flat Rock School in his early years and graduated from Wagoner High School in 1959. He worked as a heavy equipment operator and would sometimes work two jobs just to make ends meet always providing for his family. In his free time you could find him mowing the grass and taking care of his cows. One of Lonnie's favorite past times was going for drives and checking out the new baby calves that were just born. One of the most important parts of Lonnie's life was his family, he loved getting together and eating and sharing great stories. He will always be remembered as a strong man that worked hard to take care of his family teaching them valuable life lessons along the way. Lonnie was preceded in death by his parents Jake and Beulah, two brothers, Wayne and Perry Wassom and his sister, Martha. Left to cherish his memories are his daughters, Lonnette Hay of Tulsa, OK. and Nanette Filkel of Colorado, his brother, Kenny Wassom, sister Margaret Rook. He will also be missed by his grandchildren Tanner , Trevor , Taren, Timothy and Lily . A service to celebrate Lonnie's life will be held at 2:00 P.M. on Friday, November 9, 2018 at the Shipman Funeral Home Chapel with Life Celebrant Anita J. Shipman officiating. Arrangements are under the care of Shipman Funeral Home & Crematory, Wagoner, OK.